Capoeira is an Afro-Brazilian artform where martial-arts, dance, acrobatics, music, creativity and ingenuity come together. The origins of capoeira are found in the times of slavery in Brazil. The slavery started growing in the 17th century when the Portuguese shipped Africans to work for them as slaves in Brazil. In Africa there existed dances, martial-arts and music that the Africans brought along to Brazil, together with their cultures and religions. These components all mixed in Brazil. With the passing of time, slaves and ex-slaves develloped capoeira at different places in Brazil. You can say that without African influence there would be no capoeira in Brasil today as we know it, but that in Brazil all the African influences together with other influences have blended into what we now consider capoeira. Since then capoeira develloped itself at different locations and does not stem from one person who one day created capoeira and registered it. Nowadays there are many variations to be found in Brazil together with other cultural expressions which also contain African roots. Capoeira also became folcore of Brasil with traditions emerging over time who are now maintained by a number of masters. Capoeira is an art where creativity is a way to deal with several things happing in the art. This has led to many adjustments and variations over time, many of which are (re)-invented over time, based on the taste and experience of it's practisioners. For an understanding of these adaptations, an understanding of the position of capoeira and it's practisioners over time, is essential. There is no clear date known which marked the beginning of the first capoeira beeing praticed and even now capoeira is still changing. Nowadays capoeira has expanded a lot leading to various different lineages with there own selection of rules, style, ethics etc. A number of masters have helped capoeira grow and transform in the past century. They left their lessons and Filosophy with the newer generations who maintain these traditions, now and then adding or changing components based on their experience, judgement and taste. Within capoeira several groups value the research of capoeria traditions, but many schools also spend time trying to innovate capoeira in many ways. Capoeira has been persecuted in Brazil and could only be practised for a long time in secret. Nowadays due to the effort of several people capoeira is practised out in the open and is asked to contribute to commercials and videoclips mostly due to it's spectaculair dynamic aspects. Several campaigns and projects in Brazil have contributed to the further integration of capoeira in the Brazilian society and it is now to be found at al kinds of locations within Brazil and the rest of the world, like community centers, universities, gyms etc. Not only the number of movements, the expansion of songs but also it's diffusion around the world and the strong growth of capoeira practisioners have changed the position of capoeira permanently. A big number of masters have contributed to capoeira, making it possible for the current state of development beeing where it is at. Naming al of these masters and contributions is not possible but a few masters (that already passed away) will be cited below. This master is seen as one of the most important representatives and preservers of a capoeira stijl that is nowadays called, Capoeira Angola. He gave lessons for years, wrote a book, recorded an LP and is know for his capacity within capoeira and his philosphy that he was able to express in poetry. 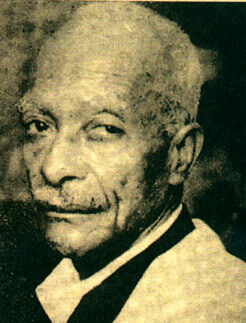 A few people from his academy who continue his lineage and keep his name alive are: Mestre João Pequeno, Mestre João Grande, Mestre Curió, Mestre Bola Sete, Mestre Bigo, Mestre Gaguinho, Mestre Gildo Alfinete and others. This master is the creator of a capoeira style nowadays called Capoeira Regional. He developed with great creativity this style from out the already existing style of capoeira, batuque and other influences. He created a teaching method with sequences that were also included in a booklet published together with an LP he recorded: Curso de Capoeira Regional. He also created rhythms on the berimbau with their own type of game and was the master who introduced the term batizado and formatura within capoeira, together with a graduation system. He was known for his charisma, martial arts capacities and also for his wisdom through life and musicality. A number of students who where taught by him and thus stem from his lineage are: Mestre Decanio, Mestre Jair Moura, Mestre Damiao, Mestre Acordeon, Mestre Itapoan, Mestre Xareu, Mestre Nenel(his son) and Mestre Camisa Roxa. This master held a roda (capoeira circle) for years each sunday in the Liberdade neighbourhood of Salvador. He was famous for the level of his roda and his singing capacity, having knowledge of various songs that talked of life and it's lessons. 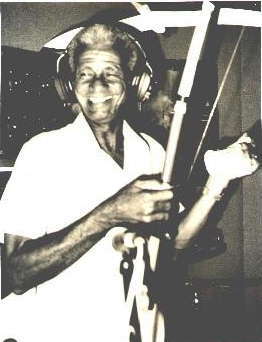 He was recorded several times in his life and in the eighties recorded an LP together with Mestre Canjiquinha. 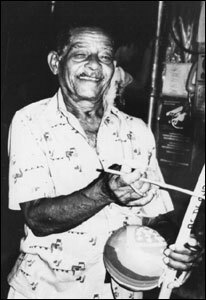 He was a famous producer of berimbaus (nowadays the principle instrument within capoeira), and said to be the first one to paint them, making this one of his main sources of income: selling berimbaus. His roda influenced artist in Bahia in the fifties, like Carybé and Mario Cravo and he appeared together with some of his students in a short movie, called "Vadiação"
(Mestre Bimba also participated in this movie.) A number of students who where taught by him or where influenced by him are: Mestre Traíra, Mestre Zacarias Boa Morte, Mestre Bigodinho, Mestre Ananias. For many years this master gave lessons and shows in Bahia. A master who knew a huge number of songs and did not only knew capoeira, but maculelê, samba de roda and puxada de rede as well (all folcloric expression of Brazil). These he inclued in his shows which helped establish a connection between the four components. He created own rhythms on the berimbau, wrote a book, recorded an LP together with Mestre Waldemar. Because of his connections with public relations and his outgoing talent he appeared several times in movies in the sixties demonstrating capoeira. (Barravento, Capitães de Areia and Pagador de Promessas for example). A few students who trained with him or people that where influenced by him are: Mestre Geni, Mestre Paulo dos Anjos, Mestre Edvaldo Baiano, Mestra Cigana, Mestre Brasiliá and Mestre Suassuna.